The main reason I wanted to attend Mid-Americon/WorldCon is this: the novel I’m working on is set mostly in eastern Kansas. With my characters traveling the area in 1872, I needed to know what their experiences might be like. So I traveled to Kansas early, and did some area research. I loved my Kansas/Missouri experience (of which more news will follow) but let’s start with the Black Archives of Mid-America in Kansas City. My novel contains one small but pivotal section set in Kansas City. I needed to know how this mixed-race group was going to navigate the city, and what it would be like when they got there. So I contacted the archive, as you need to let them know you’re coming. Emiel Cleaver forwarded my questions to Glenn North, who put me in touch with archivist Geri Sanders. Geri was incredibly helpful. As I feared, there wasn’t as much about the era I was interested in as there was for later times. However Geri was generous with her time and resources, tirelessly scouring the archives for books containing valuable information about the geography of the city at the time, the history of local slavery and reconstruction, and some wonderful people who lived during the period. William D. Matthews (c.1827- 1906) moved to Leavenworth, Kansas in 1856, had a station on the local Underground Railroad, and recruited ex slaves to fight for the Union during the Civil War. James Milton Turner (1840-1915) was born a slave in St. Louis, but his father was able to purchase his freedom. He attended Oberlin College until he had to return to care for his family after his father’s death. While in St. Louis, he attended John Berry Meachum’s floating Freedom School on a steamboat on the Mississippi River. The Freedom School was established to evade Missouri laws against education for blacks. Turner served in the Union Army. After the war, he was Missouri assistant superintendent of schools, helping establish Lincoln Institute (later Lincoln University), the first institution of higher education for African-Americans in Missouri. In 1871, President Ulysses S. Grant appointed him ambassador to Liberia, making him the first African-American to serve in the U.S. diplomatic corps. Mrs. Alpha Minor Smith sold notions door-to-door until 1870, when she was able to open a dressmaking shop and notions store in the West Bottoms neighborhood. Her shop was the first in Kansas City to carry ready-to-wear clothing for ladies. In addition to the biographical information, I also have possible scene locations (early churches) and local legends (like Hiram Young) to add verisimilitude. I can’t thank Geri Sanders (and all the people at the Black Archives of Mid-America in Kansas City) enough for their help with my research! For more information about the Black Archives of Mid-America in Kansas City, you can visit their website, Facebook, or Twitter. This entry was posted in Filling the Well, Travels and tagged Black Archives of Mid-America in Kansas City, Geri Sanders, Glenn North on September 14, 2016 by brennancm. With a title like CB’s Mojo, you probably figured out that this blog is mostly about the stuff that makes me feel happy or inspired. In terms of world events, it’s been a tough month for that. Cookie, Sis and I were in Paris for about 6 days at the end of September Here are a few pictures of the trip. I may share more later, but these are the photos that especially spoke to me after November 13. This entry was posted in Travels and tagged Cookie, Paris, Sis on December 8, 2015 by brennancm. The town of Bath, in Somerset, is a UNESCO World Heritage Site. It has a long history, and was apparently well known for its healing waters even before the Romans built a spa there around 60 C.E. 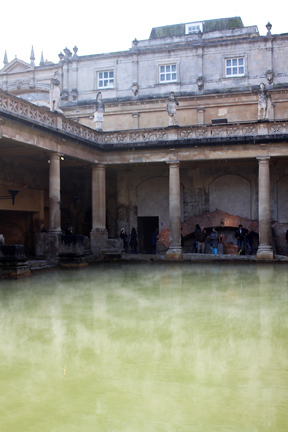 They dedicated this temple and bath to Sulis Minerva, a hybrid British-Roman goddess…because the Romans hardly ever reinvented the wheel; they were far more likely to let a couple of goddess wheels smash together (like Sulis and Minerva) and see who crawled out of the wreckage. 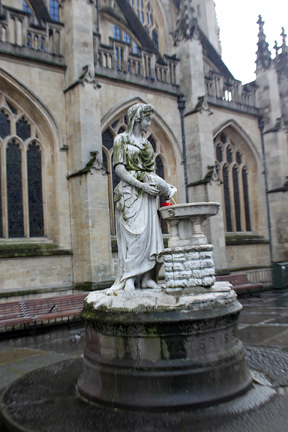 As fascinating as the history and mythology was, however, we might never have cared much about Bath if not for Jane Austen (and later, especially for Sis, Georgette Heyer). 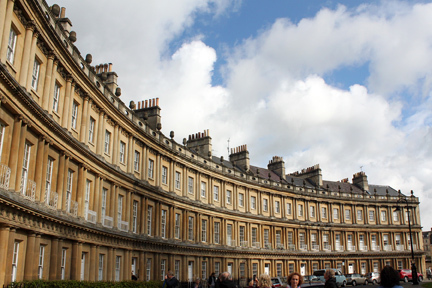 The Bath we wanted to see was the Bath of the Royal Crescent, the Circus, and the Assembly Rooms, all built out of warm. golden Bath Stone. According to our guide Viv, local legend had Bath being discovered by Prince Bladud, who was banished from the royal court because he had leprosy. In order to keep body and soul together, he became a swineherd, but unfortunately his pigs also contracted his disease. One day, he noticed them wallowing around in some hot springs and—wouldn’t you know it?—coming out completely cured. He hopped in the springs himself, was also cured. When he later became king, he built a city at this magical site out of gratitude. That explains why you see acorns (which Bladud’s pigs liked to eat) all over Bath. 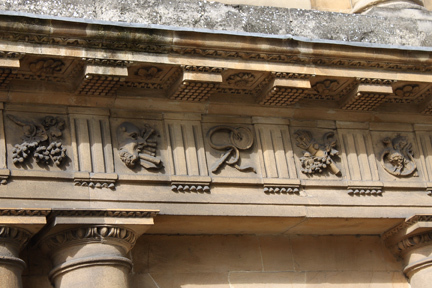 We found some other interesting symbols around Bath, especially in the Circus. Wouldn’t it have been fun if the Circus was filled with animals and acrobats? No such luck. The name actually refers to the fact that the buildings in this area of Bath are built to form a circle (aka “circus” in Brit-speak) around a park. 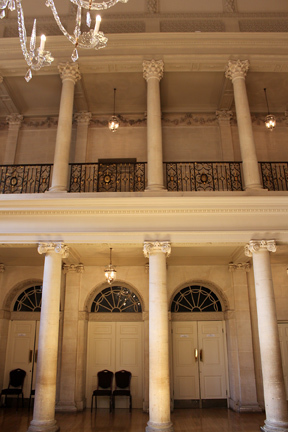 There were designs above the columns that are reputed to have Masonic origins. I was so delighted to think of Freemasons being responsible for building large portions of Bath, I could barely contain myself, but instead of dancing, I just took pictures. 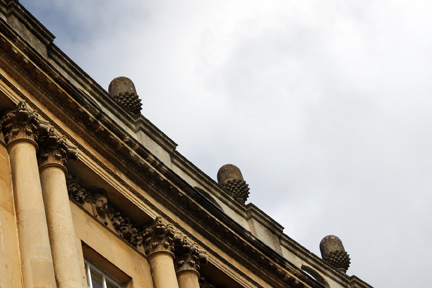 After oohing and aahing over the Royal Crescent and the Circus, we headed for the Assembly Rooms. From 1705-1760, the balls and other social activities at the Assembly Rooms were organized (and apparently ruled with an iron hand) by the town’s Master of Ceremonies, John (aka “Beau”) Nash. He was good at getting people to mingle, but my favorite story about him hearing how he kept an eye on the eligible young ladies who were seated, bleacher-style, on one side of the ballroom. If a young lady wasn’t asked to dance within a certain period of time, she would be escorted to a bleacher near the back wall, out of the light, so people wouldn’t have to look at her pitiful loser-hood. Viv thought this was the origin of the term “wallflower. Seems like a legitimate explanation, but holy cow! This Nash guy was harsh! 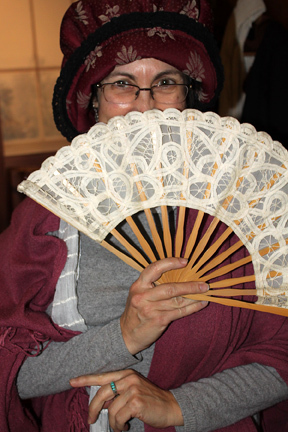 Then it was on to the Jane Austen Centre. and Sis posed with Mr. Darcy (see his portrait, way in the back?) as we awaited our cream tea. Warm scones the size of hockey pucks with cream and jam, and numerous flavors of tea! 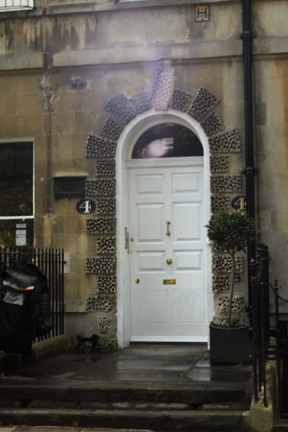 It’s possible that the door above leads to one of the places Jane Austen lived when she lived with her father, mother and sister in Bath. At any rate, it’s in one of her neighborhoods; the family lived in about four different spots during their time in Bath. We went to the Roman Baths as well, but unless you’re a huge archaeology fan (or you have more time than we had allotted to Bath), you might not want to spend a lot of time there. 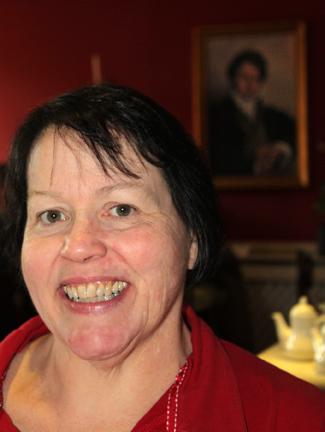 Cream tea in the Regency Tea Room was much more fun! 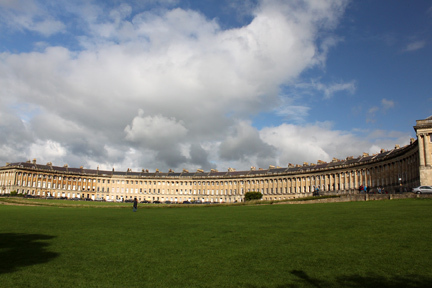 This entry was posted in Travels and tagged Bath, Beau Nash, Bladud, cream tea, Freemasons, Georgette Heyer, Jane Austen, John Nash, Royal Crescent, Somerset, Sulis Minerva on October 13, 2015 by brennancm. 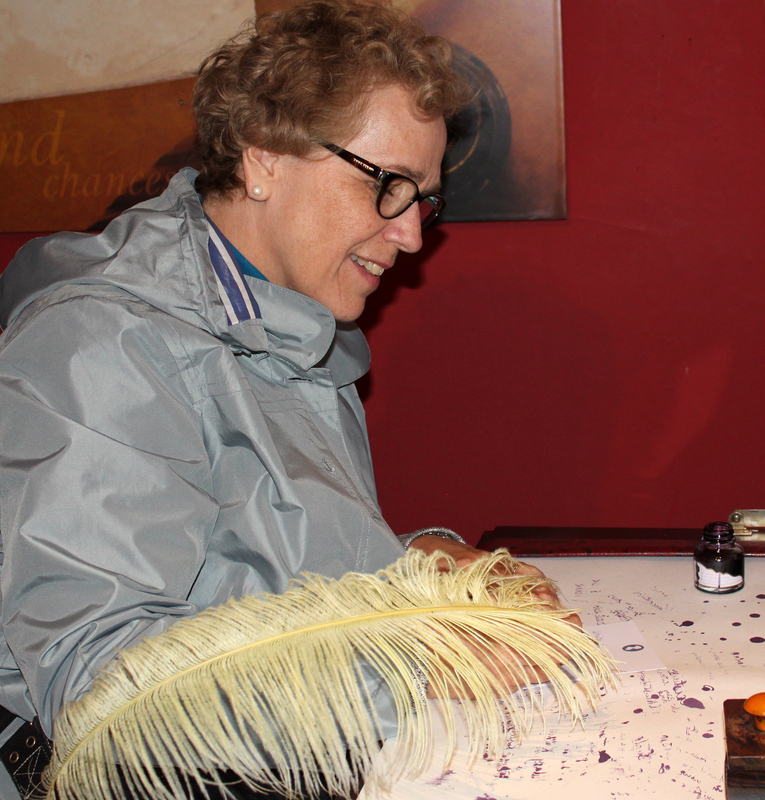 Cookie took care of our arrangements, aided by her travel agent at Artisans of Leisure. 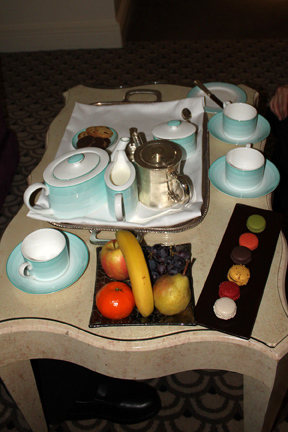 We ended up with absolutely fabulous hotels in both London and Paris. Here are some of the cool things that happened at Claridge’s, aka Buckingham Palace’s spare rooms. Apparently when the royal family doesn’t have room for all their guests, they ship some of them over to Claridge’s. It took us two days to get through the macarons, three or four days to get through the champagne (it’s all rather a blur), and we never quite finish all the fruit, though we put up a good fight on that front. Our first morning, our guide Viv saw a British comedian whose name I can’t remember, probably because I wasn’t familiar with him. He was hidden in the celebrity breakfast area (which doubled as a bar in the evenings), just off the public restaurant where we were breakfasted. When the mirrored door leading to this hideaway opened, Viv caught a glimpse of a server bringing something to Mr. Famous Comedian, and got all fan-girly. Then as we were leaving the restaurant the next morning, we saw Harvey Keitel, probably on the way to the same little hideaway. It must have been his first morning there, because they hadn’t yet shown him how to avoid being seen yet. There were also reports of Joan Collins, and we spotted a very well-put-together older woman who was definitely “somebody,” if one judged by the stir she caused when she walked through the lobby. Maybe a British actress? “Up ahead there” was perhaps ten yards from the car. We stared at Clive, our mouths opening and closing like guppies. Clive is a prize-winning fisherman, so maybe that’s what he was after. There was some temptation to blow off our theatre tickets and hang out in Leicester Square, but that was momentary. After all, it wasn’t like we were going to be able to chat up Matt, Jessica, Ridley, or any of their pals even if we could get into the premiere. So it was off to the Globe for us, to see Nell Gwynn. But that’s a post for another day. 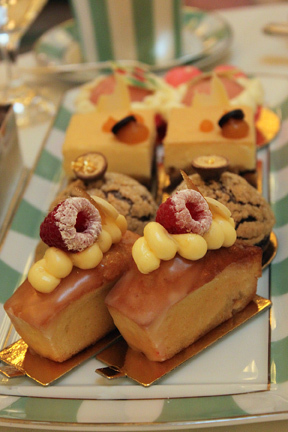 You can get a fancy afternoon tea in London. 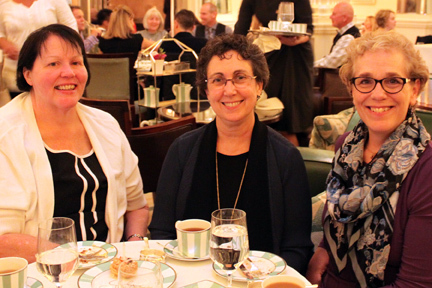 Sis took Cookie and me to tea at Claridge’s, and you don’t get any fancier. We had champagne (do you sense a theme?) and of course, many types of tea from which to choose. I was boring and predictable, and chose Claridge’s Blend. Sis, being more adventurous, had White Silver Tip. Cookie tried the Iron Goddess of Mercy. Seemed apt. The ritual was familiar; we began with tea sandwiches, and there were several tasty vegetarian choices. Then we had the best scones (plain and raisin) I personally have ever eaten, accompanied by Cornish clotted cream and Marco Polo jelly—fruity and mildly spicy. At this point, we were so full we could do little more than sniff the gorgeous pastries that ended tea: a strawberry mousse nestled on a large, macaron-type shell, a fluffy apricot dessert much like a light cheesecake, lemon cake with raspberry filling, and a mocha pastry with half a malted milk ball on top. Our waiter asked if we would like our unfinished pastries sent to our room, to which the answer was a resounding yes. We saw him the next morning at breakfast, and he asked if we had finished them later that evening. We had to admit that we hadn’t been able to. After a walk down to the Serpentine in Hyde Park, we were pretty much done for the night. The pastries ended up being our dinner the next night, if memory serves. We had a lot of dessert for dinner during this trip. That’s okay; we were on vacation. This entry was posted in Travels and tagged champagne, Claridge's, Clive, Cookie, Globe Theatre, Harvey Keitel, Hyde Park, Joan Collins, London, Matt Damon, Nell Gwynn, Serpentine, Sis, Tea, The Martian, Viv on October 6, 2015 by brennancm.